The Gold Rush continues with the 2012 Topps Series 2 Baseball wrapper redemption. The new set of Gold Rush cards expands the checklist with 50 new players. Randomly inserted autographs include Yu Darvish, Bryce Harper and Ken Griffey Jr. Each 2012 Topps Series 2 Gold Rush pack comes with five cards. 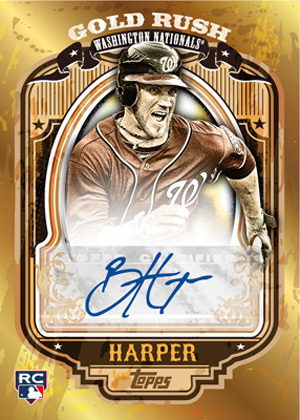 After quickly running out of wrapper redemption packs for 2012 Topps Series 1 Baseball and a similarly styled program in 2012 Bowman Baseball, Topps has made some tweaks that should help more collectors get in on the action. First, the program expands from being a hobby-exlcusive to one that covers both hobby and retail. 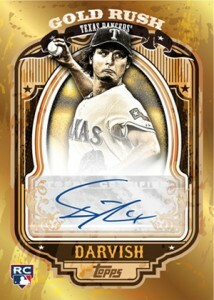 A total of 10,000 2012 Topps Series 2 Gold Rush packs are reserved for hobby packs. Another 10,000 are available for retail wrapper redemptions. Also, Topps has instilled a limit of ten redemption packs per household. To get a redemption pack, collectors must send in either 50 hobby wrappers, 14 jumbo wrappers or 50 retail wrappers (from 12-card packs only). Although collectors can bundle wrappers into the same package, hobby and retail redemption requests must be sent separately. Envelopes must be clearly marked 'Hobby' or 'Retail.' Requests that mix hobby and retail wrappers will not be accepted. In an effort to prevent those who might find packs before the official release date, all wrapper redemption requests cannot be postmarked before June 6. After running out of their 2012 Topps Series 1 Gold Rush packs that they'd honor remaining requests that were sent in by the deadline with Series 2 packs. Topps said via Twitter that these packs are not part of the announced hobby or retail allocations. So each will still have 10,000 packs. The 2012 Topps Series 2 wrapper redemption program will run until supplies last. Here are the 5 best deals on hobby boxes currently listed on eBay. What about mixed hobby jumbo and hobby regular? I have an HTA box reserved that has 10 jumbo packs. How many more regular hobby wrappers would I need? Shaun (ID 42503) � All packs must be the same, no mixing. After making out on the Bowman redemption, Brent&Becca ain’t gonna be too happy about the 10-pack limit.